Nobel Prize-winning science was celebrated at a special event. On Monday, representatives from across the Queen’s community gathered to celebrate two new installations that will commemorate the Nobel Prize-winning research discoveries of the Sudbury Neutrino Observatory (SNO) scientific collaboration led by Dr. Art McDonald, Gordon and Patricia Gray Chair in Particle Astrophysics Emeritus in the Department of Physics, Engineering Physics, and Astronomy at Queen’s. 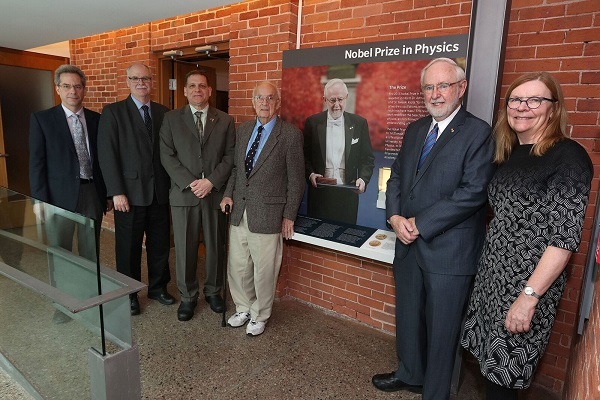 Dr. McDonald was the co-recipient of the 2015 Nobel Prize in Physics for his discovery of neutrino oscillations, a phenomenon which proved that neutrinos have mass. He shared the prize with Takaaki Kajita of the University of Tokyo, whose research made similar detections possible. Neutrinos, which are sometimes referred to as the ‘building blocks of the universe’, are tiny subatomic particles with almost no mass and no charge. The SNO Collaboration’s discovery increased human understanding of these particles, which ultimately helps scientists understand how stars, galaxies, and the universe itself has evolved since the Big Bang. To celebrate the discovery, the university has unveiled a monument between Ontario Hall and Grant Hall to share the fascinating story of the neutrino breakthrough with visitors to campus. This plinth is part of the Queen’s Remembers series, an initiative that commemorates those who have made significant and noteworthy contributions to Queen's University. Additionally, a replica of Dr. McDonald’s Nobel Prize medal will be permanently displayed at the Agnes Etherington Art Centre. The display will be located in a busy hallway between the gallery and Etherington House, and will include details about the experiment. Previous Queen’s Remembers plinths have recognized the traditional inhabitants of the Kingston area—the Anishinaabe and the Haudenosaunee peoples—and the 5th Field Company, a group of soldiers primarily comprised of Queen’s students and faculty who served and gave their lives in both World Wars. To learn more about the Queen’s Remembers initiative, visit the Queen’s Encyclopedia.